Baits treated with Brine 'n Bite will produce more bites than untreated baits or salt-brined baits. Brine 'n Bite toughens baits and helps preserve them. Powerful bite stimulants, fish attractants, and blend of amino acids intensifies the natural smell of the bait many times more than normal. Also the amino acids trigger an impulse in fish to feed. Scent dispersants help put out a maximum scent trail. 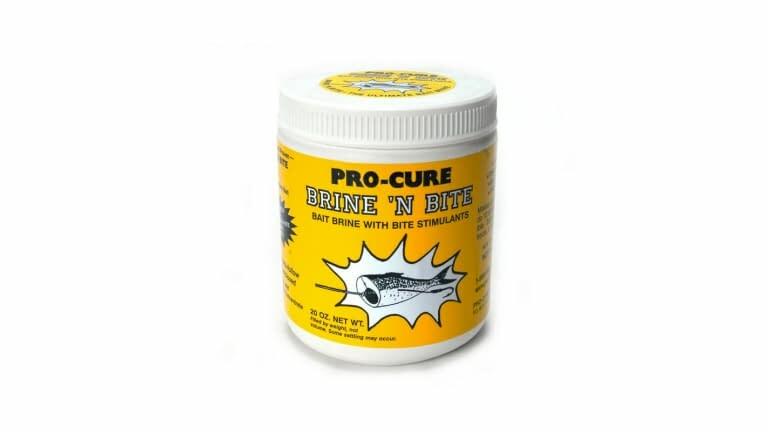 Tested and proven by thousands of guides, charter boats and tournament anglers across the country and Canada, Brine 'n Bite works great on herring, anchovies, sardines, alewives, smelt, gizzard shad, emerald shiners, etc. Can be used on shrimp, prawns, squid and brine shrimp too. For the offshore angler, Brine 'n Bite works exceptionally well on ballyhoo and ribbon fish. Packed in easy-to-use 20 oz. plastic jar. 20 oz.